Years ago, “It’s a Girl” or “It’s a Boy” cigars were pulled out and passed around to celebrate baby’s arrival. Although cigars have gone out of fashion as a baby announcement gift, parents still want to carry on the tradition of celebrating their newest addition. Today I’m sharing some adorable free printable tags that can be used for anything from baby shower favors to baby announcement gifts. For a modern take on the baby announcement gift, try something that comes in uniquely pink or blue colors. Inexpensive bottles of nail polish are absolutely perfect (especially if coming from mom! ), but there are lots of things you could use, including macarons, pink or blue M&M’s, gumballs, lollipops, single pot bags of coffee, pink or blue colored popcorn—the list could go on and on! 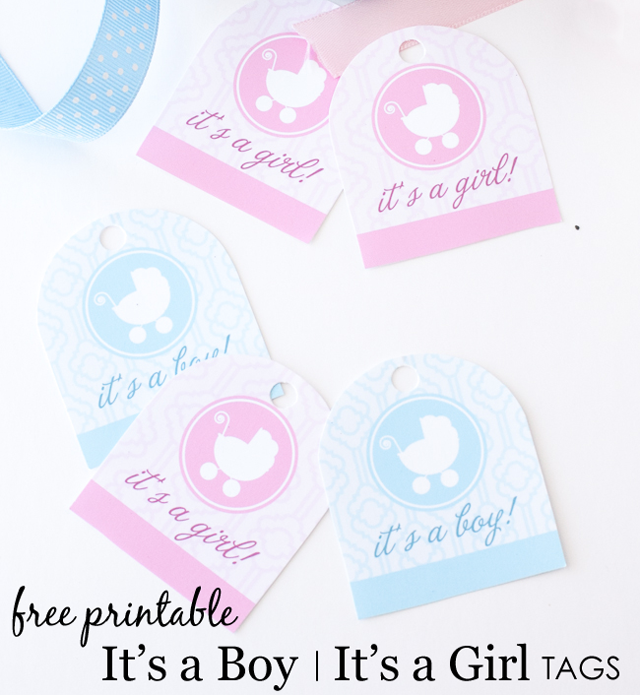 To help you celebrate the arrival of your little one, I’m sharing these free printable tags that say “It’s a boy!” or “It’s a girl!” Just run them off on your printer, cut them out and tie them on your gift of choice. These are also great little tags to use for baby shower favors. Click here to download the free printable tags, and celebrate in style!